Between the announcement of its new augmented reality tool at last week’s Worldwide Developer Conference and its stealth team of engineers devoted to the platform, it’s clear Apple is beefing up investment in AR. And in public statements the company head is making it clear he’s freaking out about it – in a good way. In an interview with Bloomberg, Apple CEO Tim Cook said “I am so excited about it, I just want to yell out and scream.” Well, ok then. For the uninitiated, AR places computer generated graphics over real-world displays. Think of Google’s since-discontinued Google Glass eyewear as an early example. Now, Apple wants to take the “profound” technology — as Cook put it — and make it mainstream. Within the industry, Apple’s AR move is being received with open arms. Beyond entertainment, Cook sees AR playing an integral role in commerce, pointing to Ikea using 3D images of its furniture to give consumers an idea of how their room would look. CES Asia, the three-year-old overseas version of the annual Las Vegas tech extravaganza, took over five halls at the Shanghai New International Expo Center to showcase the latest and greatest in consumer technology -- which included plenty of robots, smart appliances and self-driving cars. A full 450 exhibiting companies and more than 30,000 attendees test drove some products at the bleeding edge of innovation. This is not your typical overnight bag. The rolling suitcase from China’s Cowarobot can identify and follow its owner through airport concourse traffic, avoiding obstacles along the way. It also automatically locks depending on distance from the owner, alerts when it’s more than a safe distance away. The Pico Neo DKS is a wireless virtual reality rig that plays like a full-fledged PC setup, with a 2.5K 5.5 inch HD screen that smooths out the often-blurry and clunky gameplay of most mobile VR devices. The setup uses Qualcomm’s Snapdragon 820 processor to deliver substantial computing power. Like the Neo DKS, one of CES Asia’s buzziest augmented reality headsets also features the Qualcomm Snapdragon 820 processor. The HiAR goggles, which feel heftier than many other AR sets, use artificial intelligence as part of an always-on voice control capability -- as augmented reality continues to move toward a “Minority Report” future. 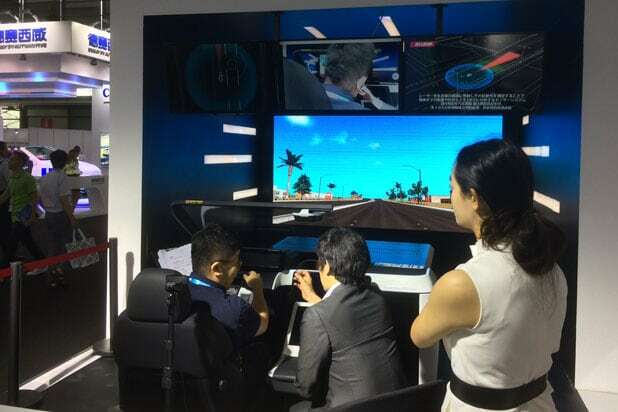 In case you hadn’t noticed, virtual and augmented reality was kind of a big deal at CES Asia – as it was at the flagship Vegas show earlier this year. Shadow Creator’s Halomini headset, which feels like a lighter version of Microsoft’s HoloLens, allows users to set appointments, chat with friends and watch videos, while keeping their eyes on whatever it was they're watching. CES Asia is full of robots, but the Danovo stood out for its fun personality – as much as that applies to an inanimate object. The egg-shaped machine from China’s Ovo Technology can navigate around items, dance, engage with people, and even project video by sliding over the top of its “shell.” Ovo also makes trash collecting and security robots, but they're a lot more serious than the Danovo. Virtual reality can be lonely, which is why Gowild decided to add a friend. “Amber,” a 3D hologram who lives inside its pyramid-shaped Holoera device, can respond to commands, read moods – and cheer users up with a well-timed song. Another entry in CES Asia’s parade of robots was Qihan’s Sanbot, which is based on IBM’s "Jeopardy! "-winning Watson operating system. Sanbot can recognize and communicate with customers in 30 languages and process credit card payments. It also does a delightful dance, complete with glowing, gyrating limbs. The smart speaker from Chinese tech giant Baidu is the country’s answer to the Amazon Echo, only with a high-resolution 8-inch screen and camera that turns to face the user. It can handle the basics like controlling smart-home devices and playing music, and its face-recognition software allows authorized users to order food and medicine. The fishing robot includes ocean mapping, an integrated fish luring light and even an optional remote bait drop feature that allows users to place the hook wherever they want. Its camera shoots in 4K UHD and is capable of 1080p real-time streaming. It even connects with the Zeiss VR One Plus VR headset to turn real-life fishing into a virtual reality game. The unmanned aircraft is part of a plan from China’s second-biggest online retailer, JD.com, to use drones to deliver products that weigh as much as one metric ton. The company is also developing fully-automated warehouses. This lighter socket-mounted device gives cars high-speed wi-fi, allowing people in them (preferably not driving) to get work done and stream music. It connects near field FM, auxiliary dual channels and car audio, and enables sharing of 4G networks.